CLA is a research proven essential oil that can boost immunity, help reduce cholesterol and support fat loss. Reducing body fat can have a range of health benefits like increasing energy levels, improving cholesterol and better blood sugar control. Conjugated Linoleic Acid (CLA) is a naturally occurring oil found in certain foods in the human diet. ROS Nutrition sources only the finest quality CLARINOL® CLA that may help you to achieve your fat loss goal. CLA has been shown to have many positive biological effects for example the improvement of body composition, cholesterol regulation, blood sugar control, supporting immunity and protecting against free radical damage. Research on the effectiveness of CLA suggests that the level of active CLA in each daily serving is highly important. ACTI CLA® contains optimum amounts of CLA to support your fat loss and health goals. If your goal is fat loss then CLA can help you attain your goal. It works by helping to reduce appetite affording better control over energy intake. One of the most interesting claims for CLA is that it helps to reduce the levels of the hormone leptin which is one of the hormones that is known to increase appetite. Better appetite control allows people to more easily create an energy deficit which allows for effective fat loss. 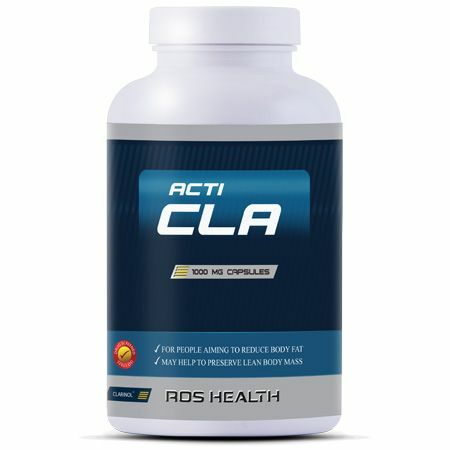 Acti CLA® is a registered trademark of ROS Nutrition Group Limited. Take 5 capsules daily. Take 2 in the morning, 2 in the afternoon and 1 in the evening. Acti CLA® is most effective when taken with food.